Christian Living | This Thing Called Life . . . Thank you all for bearing with me during my short hiatus. I am feeling a lot better now and will share more about that in a future post. Today I’m sharing an excellent post from John MacArthur’s Grace to You blog. As we begin this new year, before we get back into our study of the gospel of Luke, which we will commence again next Sunday, along with our series on doctrine next Sunday night, I want to talk to you just personally and pastorally a little bit. Last Sunday I spoke on 1 Corinthians chapter 10, on the danger of spiritual privilege, from the verse, “Let him who thinks he stands take heed lest he fall.” How that those who are singularly blessed can become smug about that blessing and thinking they’re firm in their stand can be headed for a serious collapse. I want to follow up on that same perspective today, because I feel like part of the ministry that I must discharge before the Lord, and you, is a ministry of warning about danger. Our church is not in particular danger from some dominating iniquity. It is not in particular danger from some infiltrating heresy. It is not in danger from some loss of resources financially or human. Everything you can see on the surface looks to be good. And we would have every reason to think that we stand, and still be on the brink of a fall. And following that idea up a little bit, we have to go to the real core of what it means to be a Christian. And I, from my perspective, believe that the church in our day is completely losing this simple perspective. I think the Christian life is essentially a simple thing to understand. It is a life of loving Jesus Christ. I know that sounds probably pretty basic, and indeed it is, but just that simple statement has been lost to us. The Christian life is best defined as an ongoing relationship of love between the believer and Christ. We don’t need to talk about His love for us. That’s fixed. The issue is our love for Christ. Evangelical Christianity has all but lost this perspective on the Christian life. Most people have the idea that the Christian life is about how much God loves me and wants to fulfill my dreams and my desires and my ambitions and my goals and my objectives. And what He wants to do is make something wonderful out of me and life me up and elevate me and fulfill all the hopes of my heart. It’s more about God loving me so much that He wants to do all of this than it is about me loving Him. But in reality, the Christian life is about loving Christ. It is about loving Him singularly. It is about loving Him totally. It is about loving Him sacrificially. It is about loving Him obediently. It is about loving Him worshipfully. It is about loving Him in terms of service. It really is about loving Jesus Christ. That’s what it means to be a Christian. It’s that you now commit your life to loving Him. Now if you understand the Old Testament, the great commandment was to love the Lord your God with all your heart, soul, mind, and strength. This is the sum of all that God requires, and your neighbor as yourself. But it starts with loving God with all your heart, soul, mind, and strength, which is just a way of saying loving God comprehensively, totally, completely. Now if that’s the sum of the Law, then that has to be the sum of the relationship. That can’t be altered when it comes to being a Christian. It is still the purpose of God that we would love the Lord Jesus Christ with all our heart, soul, mind, and strength. Being a Christian is about loving Christ so much that you want to know Him, so much that you want to exalt Him, so much that you want to please Him, so much that you want to serve Him, so much that you want to be with Him, so much that you want to tell others about Him. It’s about this overwhelming, consuming affection for Christ. This is at the core of what it means to be a Christian. And so, the real question to ask people when you talk about their spiritual growth or their spiritual condition or where they are in terms of their life is, how much do you love Jesus Christ? How much do you love Christ? Are you growing in your love for Christ? Do you love Him more now than you have in the past? Do you desire Him more now than you did in the past? We’ve all heard some version of the question, “If today was your last day on earth, what would you do?” The question is designed to get us thinking about what truly matters and what doesn’t. There is a helpfulness to this question, I suppose. I certainly don’t want to spend my last day before seeing Jesus perfecting my yo-yo technique or binge-watching Dora the Explorer. But to be frank, I find the “last day” question paralyzing. It’s overwhelming to consider all the things that could possibly be done. How does one decide what’s the most effective, impactful, God-honoring thing to do when your toes are on the precipice of eternity? How could I know if it’s better to sneak into North Korea—should it even be possible—and preach the gospel, or to track down all my unsaved friends and family so I can preach the gospel to them? Maybe I should also drain my life savings so I can give it away—but who should I give it to? Does being prepared for the second coming of Christ merely involve some extraordinary acts of obedience moments before he returns? According to Jesus, it doesn’t. What Does It Mean to Be Ready for Jesus’ Return? In the Gospels, Jesus frequently charges his followers to stay ready for his return. One such place is Luke 12:35-48. Through a couple short parables about different kinds of servants, Jesus illustrates for his disciples what it means to be ready. In this passage—contra the logic of the “last day” question—being prepared for Jesus’ return means doing the kinds of things appropriate for your context, however ordinary and mundane they might seem. If you’re a teacher, be found grading midterms to the glory of God. If you’re a Christian who works in a factory, be found working until the whistle blows. Jesus commands, “Stay dressed for action and keep your lamps burning” (v. 35). The literal rendering of the phrase “stay dressed for action” is, “let your loins stay girded.” Back in the day, to have your loins girded meant that a man was ready to work because he had pulled his long, flowing robe around to the front and tied it tight so that it wouldn’t interfere with action. Sharing today from Gospel Relevance. John Calvin is associated with someone’s death. He wrote one of the most influential Christian theological books of all time. Privately, he was shy and awkward. In public, he moved around with stunning confidence. He was impatient and bashful, yet pastoral and caring. We have never seen — and probably will never see — anyone like him. 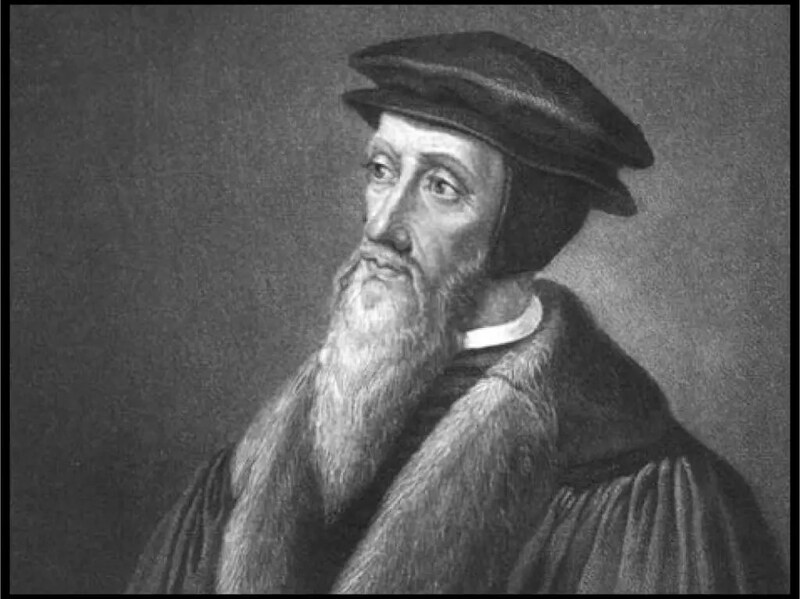 Who is John Calvin, you ask? I have intentionally studied Calvin’s life over the years. This post is somewhat of a brief biography of his life. Let’s start with the early years. Calvin was born on July 10th, 1509 in Noyon, France. He was the first of four children. His mother died when he was a child. Calvin had brothers named Antoine and Charles, and a half-sister named Marie. His father, Gerard Cauvin, was over 50 when Calvin was born, and he eventually died of testicular cancer but was an influence in Calvin’s life. He (Calvin’s dad) remarried after his first wife died, although little is known about either one. While Calvin did not write much about his personal life, he respected his father. John Calvin’s intellectual abilities were quickly noticed by his father and others. Calvin was on track to study theology and move forward into a position within the church. However, in 1526, his dad directed him to abandon his theological studies and to begin studying to become a lawyer. And he did, studying in Orleans and Bourges until 1531. His studies in law would later help him as a thinker and writer. However, John Calvin did not become a lawyer, but a pastor, and that was soon after his conversion.